btw,it is old wallie that i stored in my computer for long time ago. and it seem that you only focus on the characters intention like you know avenging something holding a sword yada yada yada... the coloring is nice too :3 though the bg is kinda blurried but i guess you made it that way. though i'm not fond on the glowing part of the scan OX it doesn't fit with it becoz the scan is not already part of the bg, it looks like the scan is floating together with the broken glasses. So it would be best if you remove the glowing part of the scan and let the broken glasses take the role of the glowing part ;) but overall nice bloody part wall :D + fav! 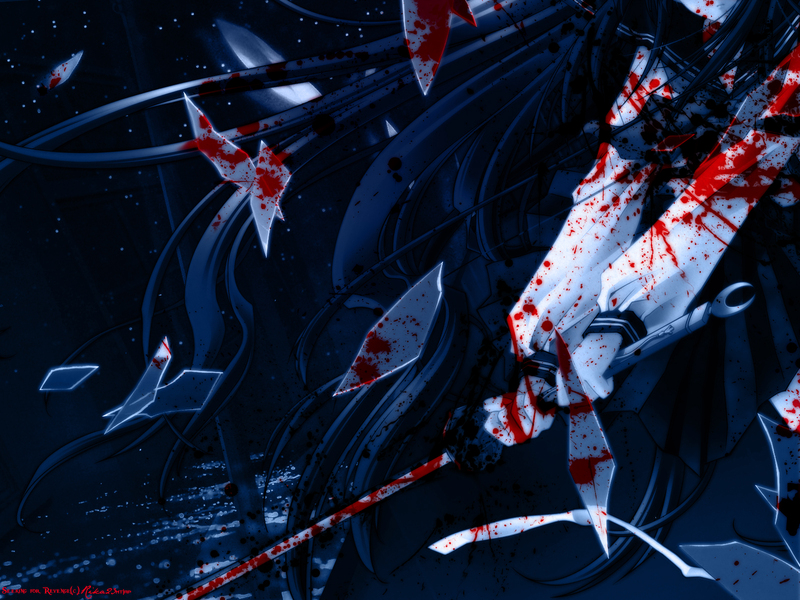 O this wallpaper is so bleeding! I like that dark colors! Really cool way you cut her off, the glass is a great touch and I like the simple background! The blood is also neat, but there might be too much. Or maybe it's just a bit too bright. Other than that though, great job! u know, reminds me of the crzy jaoanese girl from kill bill u remember her? very scary but very neat! oh nice ri chan XD its kool haha like the blood ^^ which brush did u use oh and the glass is the best XD is it a stock image? wow, thank you for this one, I think it's going straight on my desktop! Beautiful wall ^^ The blood effect is beautiful and the shattered glass is an excellent detail. Usually, I'm not a big fan of blood, but this is definetly an exception. Beautiful dark wall. its cool, dark and bloody, even thought i normally don't like bloody walls, this one is really good.